On February 27 we received a package back from LVA and it is taking a little thought to get through all he communicated. There is one discovery VAM and we will post that information here and on VAMworld when we are through understanding the totality of his letter. These are from our last batch at VSS and we have the images as well as the LVA plate images. We will post all of those here and on VAMworld as soon as we digest the information. The new VAM identified is VAM 72 - Doubled 18, Polished Forehead. But also included are revisions to VAMs 9 and VAM 20, together with the recommended combining of VAMs 1E and 53. Interestingly this will make the combined VAMs 1E/53 the most populous in our collection. This might also mean that VAM 53 is the most common of all 1881-O VAMs. VSS has a submission of roughly 80 coins that include the ones listed above that need to be labeled after the return from LVA. We are still working on our 100 coin bulk submission but have slowed down to try and catch up on other work. This month we join the discussion at CoinTalk.com for the first time and think there is a lot there that will help in the long run. The web site offers new connections and a broad discussion that can, at times, overlap with VAMworld. For those of us that are seeking to promote VAMing this is a great place to get the word out. Their discussion is very broad, but also well organized. The message board and forums are also technically well done and will prove a way for us to get the word out. In time we would hope to encourage others to do focused studies like this one. Surely there are other OCD types that like to dig deep into a topic. Our most recent batch of coins only added three new ones to our toned group. All three have a subtle, almost iridescent, quality and are less dramatic than others. Probably bag toned with this range of subtle but iridescent colors, and the mottled look with uneven patches of color. Humidity and wet conditions in Mint vaults results in this type color in our opinion. Perhaps two sided bag toning with the same iridescent quality to the color. The reverse has a crescent shape to the toning which often indicates overlapping coins in storage bags. Also a coin that we believe to be bag toned. The reverse has a dirty look that just looks like moisture damage. The obverse has a nice iridescence that ranges from peach to bright yellow. All things considered these are three nice additions to the collection. We continue to work down the list of missing VAMs and the progress is slow. Here is our take on the rarity of the remaining eleven VAMs in the 1881-O series. But we have cornered 90% of the known VAMs in the series and that has been no easy feat. This is our first take on how difficult these will be to find, and we will work on this topic during the coming months. These VAMs create quite a challenge because some have been seen only once and others are poorly documented. But we are on the hunt and will find them sooner or later. For now we are taking the tactic of "flooding the zone" or just purchasing coins with overlapping characteristics. This isn't a very efficient way to solve the problem, but since our collection and study are also about grade, purchases are rarely a wasted effort. Several of these VAMs lack photographic documentation and looking for traits may be the only solution. This past month we read The Value of Money by Ellen R. Feingold. This book is well worth reading even though it is much, much broader than just Morgan Dollars. In the book Ms. Feingold walks us through the Smithsonian's National Numismatic Collection in a way that is understandable and representative of our national collection. The book is also well illustrated. The national collection is about history, world connections, and forms of money. If there is any disappointment it is that about half of the book is detailed footnotes and you are left with wanting more detail about the collection. Also read this month was Coin of the Year: Celebrating Three Decades of the Best in Coin Design and Craftsmanship by Donald Scarinci. This is an informative and well illustrated book that chronicles an area of coin production and competition that was unknown to us. Apparently Mints around the world strive for recognition for their most artistic or accepted coins. The coins are great and the work really creative. But this book is for international collectors and we do not think collectors of United States coins would find a lot of value. The book lost a little credibility to us because it omitted the Gold Buffalo series, but included its silver counterpart. This coin is recognized as perhaps the best of the best here, but omitted internationally. Many of the recognized US coins were associated with the Olympics commemoratives and those barely register here. From time-to-time we like to take a side trip and learn more about the life and times of Mint workers in New Orleans in 1881. Our adventure into this life earlier often proved bleak since living conditions in New Orleans were difficult and by modern standards bleak. But all was not lost in New Orleans and there were pleasant distractions that persist today. Steamboats and Mardi Gras are two things we all associate with New Orleans no matter where we live. New Orleans was the epicenter of this activity in the United States. When we found this ticket on eBay and it sparked some questions that introduced us to this world in 1881. Was this just a normal part of the Mardi Gras festivities, or did the ticket tell a larger story? Let's dispense with the obvious, the illustrations are politically incorrect by current standards, but obviously not by late nineteenth century standards. The modern day mayoral seal has the native Americans fully clothed and the little naked guy in the middle is different but very difficult to view (a good thing). We have searched far and wide and can find no reference that would explain the exact symbolism in the seal, so let's turn our attention to the other parts of the ticket. This ticket was apparently issued to a Governor Prescott. But there was no Governor Prescott in Louisiana. This could be Governor Benjamin F. Prescott of New Hampshire, but that seems unlikely since he was an abolitionist and supporter of Abraham Lincoln. So perhaps this was an honorary or fictitious title given to some local resident; someone designated as Governor of some event during Mardi Gras. But Governor Prescott of New Hampshire might not be completely out of the running. Also on the ticket were the Charlestown Cadets of Boston so this was not an exclusively southern event. Why Friday, February 25, 1881 for the excursion? Well as you might imagine Mardi Gras started about this time in 1881. The festival lost a lot of its luster during and immediately after the Civil War, but by 1881 it was back in full swing and probably a welcomed distraction from daily life. We know there were special excursion trains to New Orleans for Mardi Gras on February 24th, so this date seems to fit right in with that fact. And then there is the Steamship John W. Cannon. Why was that specific steamboat hired for the event? It would be no surprise if we said that from time-to-time politicians like to curry favor with influential and wealthy individuals. Such is the case with the Steamer John W. Cannon. Captain Cannon was one of the most influential and wealthiest men operating on the Mississippi River. He piloted a number of different ships before purchasing his own and establishing a fleet. We have read that during the Civil War he and several others found a way to walk a very fine line and provide services to both the North and South, reaping very nice profits. We know that New Orleans did not remain in Southern hands for long, so this seems plausible. 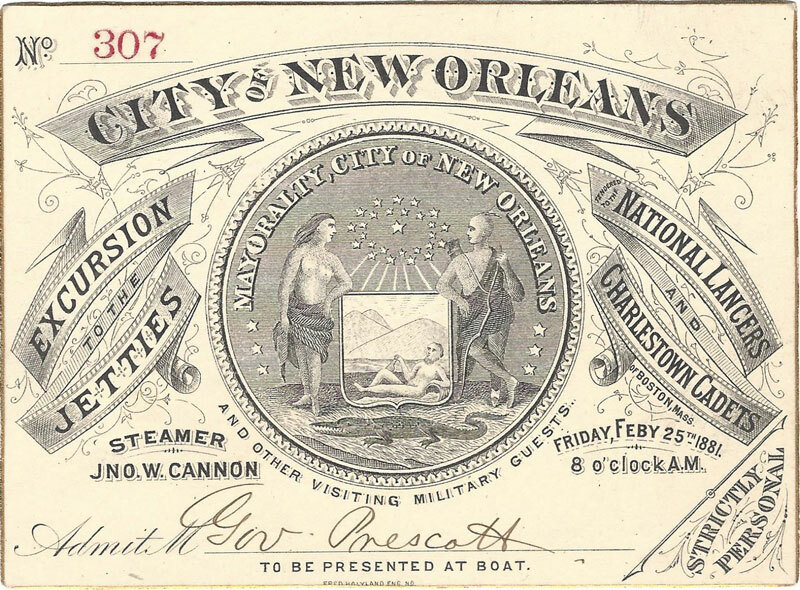 Captain Cannon became famous for piloting the Steamship Robert E. Lee during an 1870 race from New Orleans to Saint Louis. He defeated the Steamship Natchez handily and bolstered his reputation as a great captain and entrepreneur. While the Robert E. Lee was considered to be a floating palace, the John W. Cannon was said to be Captain Cannon's finest ship. So we assume it was even more opulent. Steamships were in many ways the luxury cruise ships of their day. So by holding this event on this ship the Mayor was honoring Captain Cannon and showing other people of influence a luxurious time at public expense (imagine that). Knowing that this was a political event who else might have been on the excursion? Perhaps the Assistant Treasurer, and/or the Director of the Mint? So far we have found no full roster of attendees but their prominent position in the city makes them likely. Unfortunately Captain Cannon died of pneumonia in 1882 at the ripe old age of 62, and was buried in his native Kentucky. Pneumonia, at that time, had no cure and was often a death sentence for older people once contracted.